Pictured above is one of the tacos I made for my son and I for dinner tonight, before it was rolled up of course. Buried under the vegetables and sour cream are the carnitas...delicious. But more on that in a minute. First I have a couple unrelated comments. Between urbansimplicity.com and urbansimplicty.wordpress.com there are nearly 100 followers (both blogs have the same content; while urbansimplicity.com is my main blog I mirror it's content at urbansimplicty.wordpress.com). It's a small amount but I am thankful for those that do read, comment, and email...it makes me remember that I'm not just clicking away aimlessly into the blogesphere. But what is interesting, I think, is how the majority people--first time visitors, I suppose--find there way here. According to stats there are anywhere from 300-to-400 visitors a day. Some blogs get this many visits in an hour (or less) but for me--and my idiosyncratic little blog--this is totally adequate. Anyhow, more than 90% of first-time visitors find there way here by Googling the phrase, Ezekiel Bread Recipe; this site is the second to come up. Go figure. Anyhow, for the first time visitor...I hope you click around a bit and find other things interesting, and maybe even stop back. But to simplify your search, here's a couple links within this blog. For an Ezekiel Bread Recipe that contains a portion of white flour (one of my earlier recipes), click here. For a recipe that contains all whole wheat flour--and my thoughts and philosophy behind this recipe--click here. And for a revised Whole Wheat Ezekiel Bread recipe, click here. My apologies to regular visitors who are getting tired of me carrying on about this bread (it is my favorite...but you know that)...on to the carnitas. 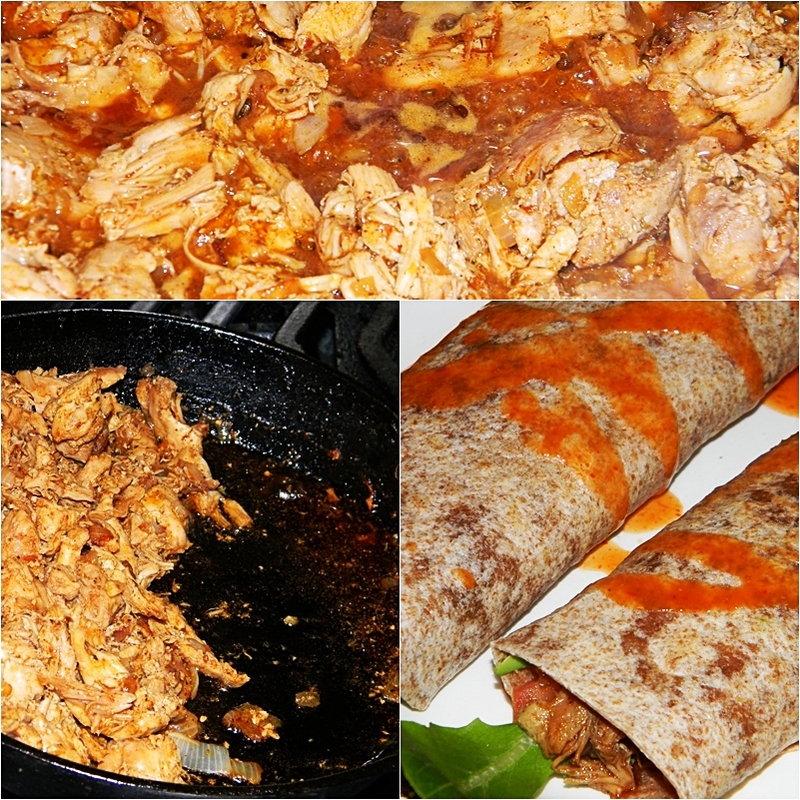 This is really a play on the classic recipe for Mexican carnitas, which is traditionally made with pork. This would be more of a carnitas de pollo, or chicken carnitas. The word, carnitas, incidentally translates as "little meats," making reference to the little pieces of the resulting dish. 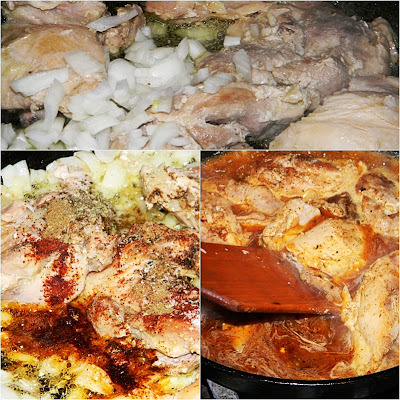 Simmer the chicken in water (with a splash of olive oil and salt) until the water evaporates and the chicken begins to fry in it's (and the olive oil's) fat. Add onion and garlic to the pan and cook it until the chicken begins to brown and the onions are translucent. Then, if you like, you can add herbs and/or spices (I added chili powder, cumin, and oregano). Add more water to the pan and scrape anything loose that has stuck to the bottom...this is pure flavor. Simmer the chicken until the water evaporates again, only this time--as the water simmers and evaporates--break or pull the chicken apart. This should be easy enough to do with a spoon and fork. When the water is evaporated you'll here the chicken begin to sizzle (remember that you cook with all five senses). 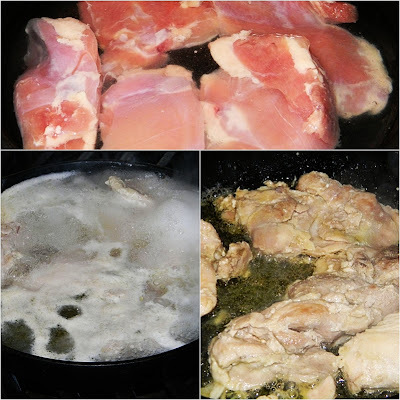 Taste the chicken to see if it is seasoned to your liking, and allow it to crisp up a bit by cooking in the fat again. Tip the pan to allow the fat to run to the other side before removing the chicken. This is a quick and easy recipe to do, and one that is so delicious it makes my mouth water just typing these words...and your guests will think you ordered dinner from a fine Mexican restaurant. Anyhow, here it is in pictures.